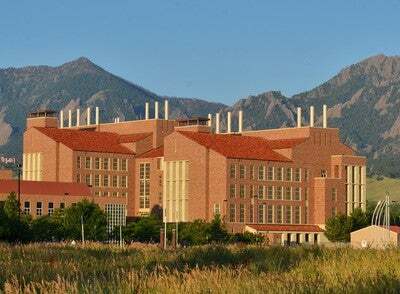 The Jennie Smoly Caruthers Biotechnology Building is located on CU-Boulder's East Campus. Take US 36 and exit at Foothills Parkway/Table Mesa. Stay left on Foothills Parkway and turn left (west) onto Colorado Avenue. Turn right at Innovation Drive and continue to our parking lot on the north side of the building. The Jennie Smoly Caruthers Biotechnology Building has a large parking lot on the northwest side of the building (#543). This lot is permit-only on weekdays from 7:30 am to 5:00 pm. The lot is free after 5:00 pm on weekdays and throughout the weekends. There are metered spaces in the lot for short-term parking as well as on the southeast side of the building. Temporary parking permits are available from CU Parking and Transportation services. Visiting vendors, with vehicles bearing their company logo, may park in the five "Vendor Only" parking spaces at the receiving dock on the east side of the building. RTD's Stampede runs between the east and main campuses. Eco-pass holders may ride the Stampede for free. Bus service is available from 7:00 am to 7:00 pm on weekdays only. Visit the RTD website for additional information on the Stampede. Our building offers a variety of bike racks, including a covered rack on the north side of the building. We are located near the Boulder Creek Path, just east of 30th Street. Bikes are not permitted in the building, so please bring a lock to keep your bike secure. We are located on Colorado Avenue, directly east of the main campus. It takes approximately 20 to 30 minutes to walk from our building to the center of the main campus. You can also walk to our building on the Boulder Creek Path, exiting the path just east of 30th Street.